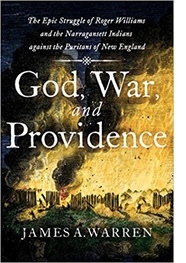 Review of James A. Warren's "God, War, and Providence: The Epic Struggle of Roger Williams and the Narragansetts against the Puritans of New England"
Luther Spoehr, a longtime HNN reviewer, is Senior Lecturer in Education & History at Brown University. In your American history textbook and mine, no matter where or when you encountered it, Roger Williams and the story of Rhode Island came right after the story of William Bradford’s Plymouth colony and John Winthrop’s Massachusetts Bay. In the hurried trip through the mid-seventeenth century, Williams flees Massachusetts in 1636, founds Rhode Island as a haven for religious dissenters, voices some important ideas about the need to separate church and state, and then pretty much disappears from the narrative. Academic historians have long paid considerable attention to Williams’s ideas; Edmund Morgan’s Roger Williams: The Church and the State (1967) and Edwin S. Gaustad’s Liberty of Conscience: Roger Williams in America (1992), among others, are still in print. But until recently there have been relatively few accessible biographies. Gaustad wrote a brief one for Oxford University Press’s “Lives and Legacies” series in 2005. The best one that I have read is John Barry’s Roger Williams and the Creation of the American Soul: Church, State, and the Birth of Liberty (2012), a full-scale treatment so vivid and immersive so that the reader feels the blizzard’s cutting wind as the author describes Williams’s escape from Massachusetts. It does justice to Williams’s intellectual life, too. Although Barry’s splendid book contains nearly 400 pages of text, it cannot cover every angle thoroughly. Happily, James Warren, a writer known primarily as a military historian (he did a study of Vo Nguyen Giap, the diminutive general who so often frustrated American forces in Vietnam), supplies new and deeper perspective on Williams’s attempts to find fair and peaceful solutions to the increasingly fraught relationships between the many Indian nations of southern New England and the relentlessly aggressive English colonies of Massachusetts, Plymouth, and Connecticut. Williams was remarkably well equipped to be a mediator. A brilliant scholar (growing up in England, he studied law with Sir Edward Coke) and charismatic personality, he earned the trust and respect of virtually everyone he met. Despite disagreeing sharply with his theological views, John Winthrop secretly warned him that he was about to be arrested in Massachusetts, enabling him to get away (and found Rhode Island). So persuasive was he that he successfully fended off attempts by the Massachusetts and Connecticut Puritans to annex Rhode Island for themselves, and finally (along with John Clarke) obtained a royal charter in 1663 that guaranteed the littlest colony’s separate survival. Williams’s scholarship and winning temperament governed his dealings with the Indians. He comprehended and accepted, in ways that Winthrop, William Bradford, and other Puritans could not, the Native Americans system of property, so different from the English. He purchased the land where he built Providence. For more than 30 years after the colony’s founding, he worked to keep it out of harm’s way, striving to keep the peace between Rhode Islanders and the Indians who lived in and around it, and between various Indian nations themselves. Warren’s narration of Williams’s efforts during those four decades provides the clearest and most accessible description of the cultural, military, and political landscape that I can recall reading. Textbooks almost invariably skip this period, hustling to get to the big, bloody finish, King Philip’s War. But that explosion could have come much sooner, had it not been for Williams's diplomatic dexterity. He juggled multiple tribal relationships, conflicts, and rivalries: not only the Narragansetts (headed variously by Miantonomi, Canonchet, Ninigret, and Canonicus) and, of course, King Philip’s Wampanoags, but also the Mohegans (led by Uncas), the Pequots (already much reduced by their defeat in 1638), and others. Simultaneously, he dealt with the growing power and avarice of the English colonies that hemmed Rhode Island in. It was power-balancing worthy of Metternich, but the English grew stronger and stronger, so the balancing act could not last forever. The Indians’ early success only fueled the English lust to become even more wolfish, and, thanks to their superior fire power, they did. The balance in New England had shifted for good. Roger Williams lived until 1683, but after nearly 40 years of deftly balancing the scales, his time as an honest broker was past. By focusing on those 40 years before King Philip’s War, however, James Warren renders his target audience, the proverbial “general reader,” a real service. His clear retelling of how Williams navigated and negotiated the tangled web of relationships between the Puritans and the Native Americans, especially the Narragansetts, grounded in substantial research in primary and secondary sources, is both appropriately complex and admirably accessible. Portraits of the Puritans of Massachusetts Bay and, especially, Plymouth colony, in their devious and avaricious glory, are far darker than their stereotypes. Warren is commendably skeptical of their versions of what happened and makes use of much recent research to balance their accounts, without merely splitting the difference. By the same token, he avoids romanticizing the Native Americans: their world before the English arrived was no peaceable kingdom but an uneasy collection of fiefdoms, and their calculated efforts to get the new arrivals to aid them against their enemies mark them as anything but naïve or passive victims. Above all, Warren successfully shines a light on a relatively neglected period of Williams’s life and provides a striking study of both the possibilities and the limitations of what religious idealism can accomplish in the world. Williams, he says, “saw more clearly than any other first-generation English settler the dire implications for the Indians of the Puritans’ inclination to mistake their own vision of truth and the good society for God’s.” He acted “not only for the welfare of the Indians, but for the good of the colony that he helped to found…. But above all, Roger Williams defended the Narragansetts and his fellow Rhode Island settlers against the predations of the Puritan establishment because he felt called to do so by the spirit of Christ.” In an age like ours, when religion is often wielded as a weapon to denigrate and divide, his is a voice and an example worth revisiting.